Basketry Designs Are Preserved In These Keep Sake Blankets from the Pacific Northwest. They are Native American Reproductions Designed and Hand loomed by Sharon Nani ~ a Non Native and owner of The Knit Tree. We have gotten many requests from various Pacific Northwest tribes and tribal members to design blankets with the various totems. The Art of the Pacific Northwest Indian Nations is a unique art style all of its own. The different graphic shapes are used to interpret different body parts and characteristics for each animal drawing dependent upon the region. These are harder to depict in a knitwear design where the subtle curves and definite lines must fit in smaller spaces with rectangular shaped knit stitches. The Pacific Northwest Coast Art is applicable to many Indian Nations ranging from Alaska to Northern California. This would include: Tlingit, Tahltan, Kaigani Haida, Nisga's, Gitksan, Haida, Haisla, Coast Tsimshian, Nuxalk, Heiltsuk, Nuxalk, Oweekeno, Nuu-chah-nulth, Makah, Coast Salish, Tolowa, Yurok, and Wiyot. 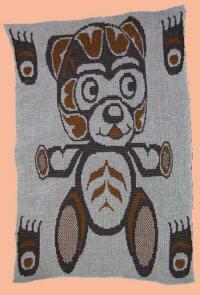 Native American Blankets are all Custom Knit so you can select your own colors for the 2 color blankets. Each design is offered in acrylic or merino wool yarn.